Huffman’s piece is posted on Cohen’s Nothing In Particular blog (criscohen.typepad.com) and she will receive a copy of Pulitzer Prize-winning humor columnist Dave Barry’s newest book I’ll Mature When I’m Dead. Cohen announced the guest post contest in early April as a way to celebrate the endorsement he received from David Barry for his upcoming book Staying Crazy To Keep From Going Insane. Cohen’s book, due out this fall, will be a collection of Cohen’s humor columns from the years he wrote for several newspapers in his native California and new ones he’s written since he moved to Cary in 2008. Proceeds from sales of the book will go to a local baseball league for kids with special needs. Tyrannosaurus Max Press, Cohen’s new small publishing company, will publish the book. Cohen intends to announce another contest related to his upcoming book in the near future. For more information on Cris Cohen, visit his blog at http://criscohen.typepad.com. 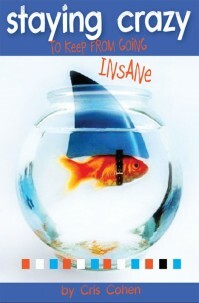 For more information on Staying Crazy To Keep From Going Insane, go to www.stayingcrazy.com.